Fundservicedirectory.com provides investment funds and investment managers a resource to research and locate companies worldwide who can deliver the services and products they need in today’s environment. As a service provider, in today’s competitive market, exposure to a global market is imperative to your success. DOWNLOAD OUR LISTING INFORMATION PAGE [HERE]. Our premium listing your company’s services and products will give you the global exposure you need to reach customers worldwide. You must be a registered member to list your company, you can register [here]. Once you’re registered you can then create a listing [here]. 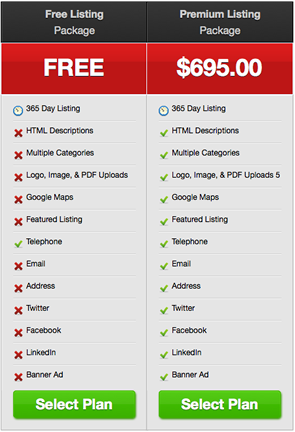 When creating your company listing you’ll have two option: basic and premium. We highly recommend a premium listing for only $695 per annum for you to experience the full potential of a listing in our directory. To claim your listing you must first create an account. * In order for you claim your listing, the email you registered with should be the same as the listing email. 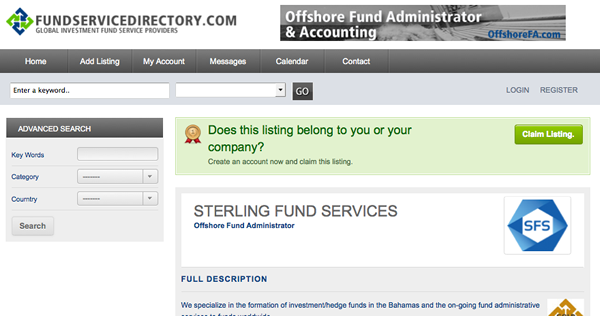 If you’re unable to claim your listing please emails us the details at members@fundservicedirectory.com.